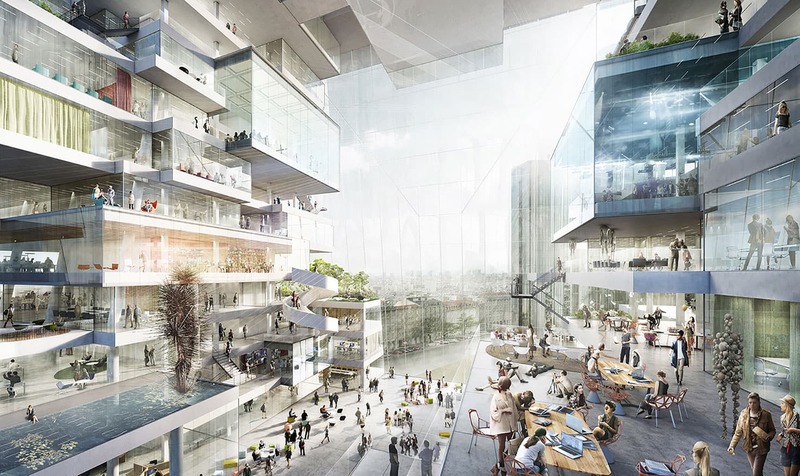 German architect Ole Scheeren has been selected as one of the winners of the architecture competition for the future media campus of Axel Springer SE, one of Germany’s most influential and dynamic media enterprises, next to Rem Koolhaas/OMA, Bjarke Ingels/BIG. Ole Scheeren’s design for the 60,000 square meter complex in Berlin presents a contemporary counterpart to the historic Axel Springer Tower and an expressive vision for a new collaborative space and identity for the digital media company. The architecture reflects the symbolic resonance with the city’s urban context. The historically charged site is located along the edge of the former Berlin Wall, which once divided the city and the world, directly opposite the existing Axel Springer Tower, then rising defiantly above the Wall. At the core of the new building floats an urban-scale void, establishing a visual axis between former East and West and conceptually reuniting the two sides. 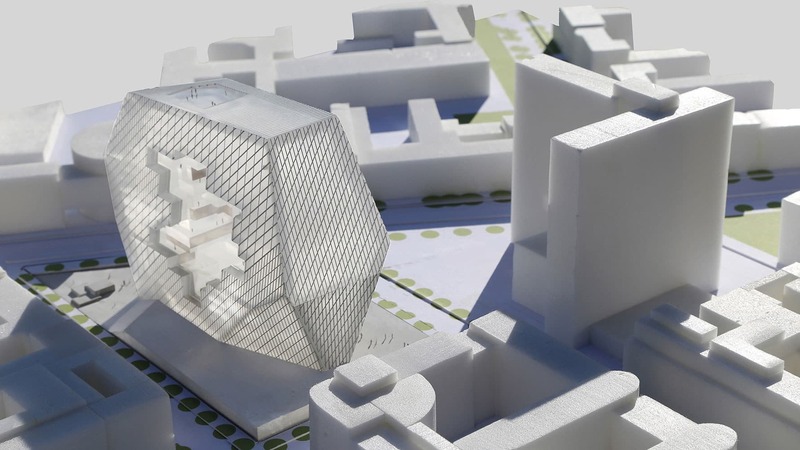 The building emerges as a symbol of transparency and historic awareness. 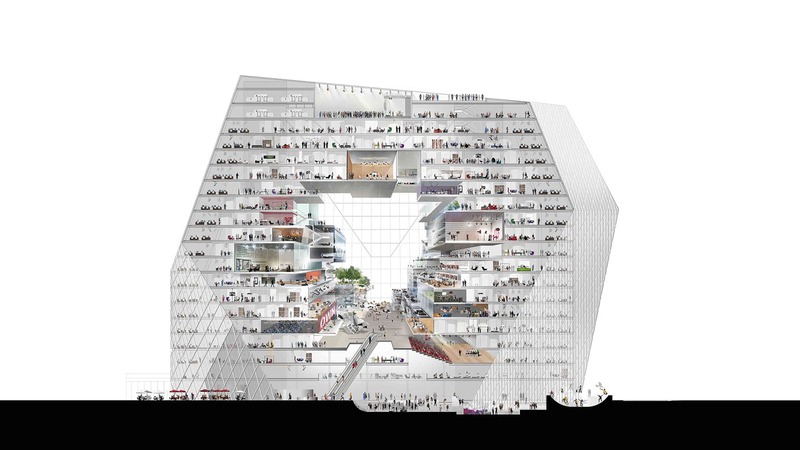 “Collaborative Cloud” forms the heart and nucleus of the building and manifests itself as the conceptual and spatial identity of the new headquarters. Identity is defined not as an object, but as space – a physical void is carved to create flexible permeable places for imagination, collaboration, and interaction. 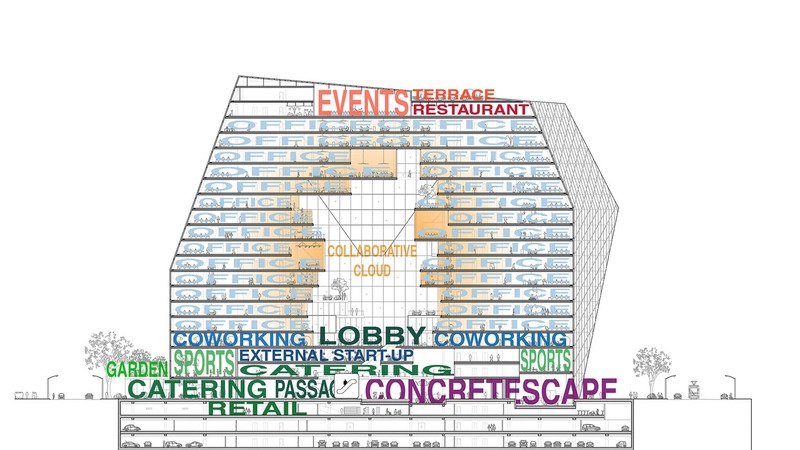 Standardized flexible work spaces are arranged along the perimeter of the facetted building envelope, which dissolve and merge into zones of informal work environments within the Cloud. A diverse array of urban activities and amenities invite inhabitation and interaction with the city and surrounding public domain. The ground levels of the building form a civic base, a market-place like environment for gatherings, and a partly sunken concrete-scape offers a multi-level surface for exhibitions, film screenings and ad-hoc urban activities. A public “passage”, one of Berlin’s ubiquitous typologies, traverses the building and connects the two surrounding public plazas. An extensive garden covers the plinth level and embraces the building, while a rooftop space provides a special area for events, with an outdoor terrace offering views across the city of Berlin. Besides a series of new projects in Europe and the United States, Büro Ole Scheeren’s international portfolio includes a range of city-defining structures and cultural projects currently under construction, including the headquarters for China’s oldest art auction house near the Forbidden City in Beijing; Angkasa Raya, a 268 meter tall building of floating rectangular volumes in the heart of Kuala Lumpur; DUO, a large-scale mixed-use development recently launched in Singapore; and Mahanakhon, soon to be Bangkok’s tallest skyscraper.